I can’t believe how many Marylanders who live in the eastern or central part of Maryland have never ventured out to Western Maryland. By that I mean the counties of Washington, Allegany and Garrett. It’s a real mystery to me in light of all the wonderful things to do and see. You don’t need a covered wagon to get there either. From downtown Baltimore you’ll begin seeing the mountains before you even get that far. You’ll see them at Frederick. And that is probably just a hour away. For this blog I will be concentrating on Allegany County, specifically Cumberland and even more specifically the Cumberland Inn and Spa, the Western Maryland Railroad and Ristorante Ottaviani. 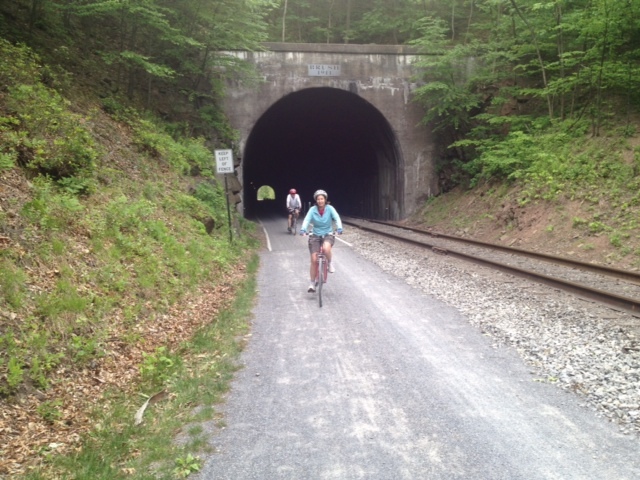 I took the ride from the Cumberland Station, 13 Canal Street, to Frostburg (32 miles). It was about one hour and passed some lovely countryside. When you arrive at the destination, one option is to take a walk along Frostburg’s main Street. To me, the most interesting part of the walk was a visit inside the Hotel Gunter, a historic property with a glorious grand staircase, which might bring to mind the one on the Titanic. Not that any of you are old enough to have been on the ship. But it’s definitely worth a look as is a look at the pictures on the Gunter’s walls. The town is about 100 yards away from the station. But if you get tired ,a shuttle will pick you up in town. I also wanted to see Frostburg State College, but time didn’t allow that, though I was told it is within walking distance. This Frostburg trip runs Thursday through Sunday. There are other opportunities to ride the rails. Saturdays you can hop aboard a dinner train and on Sundays there’s something called the Maryland Junction Express. The train offers First Class, the Parlor Car or Premium Coach. You also can charter the caboose. I don’t think it really matters where you sit, all seats provide great views. Prices vary with your seat location and tour. The average prices range from $33 to $60, but for the special trips, like the Saturday dinners, it’s $85. By the way, you might ask about the Murder Mystery events. For more information call 301-759-4400 or go to www.wmsr.com. OK, the train ride is done, now it’s time to eat. I’m going to suggest Ristorante Ottaviani, 25 North Centre Street. I love Italian, so the restaurant was a hit to me before I even arrived. This is locally owned and operated and I did get the chance to meet son and mother, Tony and Adrienne. It is open for dinner only Tuesday through Saturday. 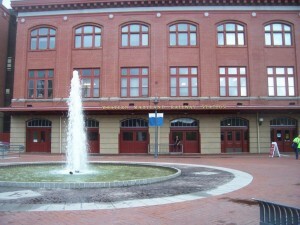 The building is about 100 years old, but trust me it is very modern, comfortable and has that feel at home atmosphere. It is a popular spot with the locals, and that is always a good sign. The kitchen is at the front so you can see the chefs at work as soon as you enter. You will also be able to delight in the aroma of the Italian food cooking. If you weren’t hungry when you walked in, you’re hungry now. The main dining room is ahead, with outside seating when appropriate, and a bar. Upstairs is more seating or a space for a private function. And the sauces are from Grandma’s recipe. Not sure if it is a secret recipe, but do you know anyone who will tell you all their cooking secrets? If I get back to Cumberland, this I where I’m going. 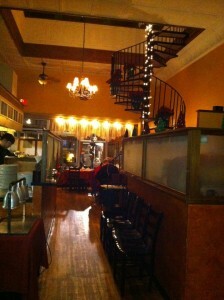 Reach them at 301-722-0052 or www.ristoranteottaviani.com. Spa on premises. It specializes in massages and facials. I had a facial and felt like Brad Pitt. Unfortunately I didn’t look anything like him. You can pull right up and park in the lot in the back, ring the bell and you’ll be greeted by a staff member who will sign you in and show you your room. There are 13 of them and each has a different look. You can walk here from the train and to most of the downtown attractions. The Inn is also locally owned and the Innkeeper takes great care in making sure all guests receive the best service. I enjoyed relaxing in the evening in the lounge, with a TV. Snacks are available in case you get the ‘snackies’ at night. Each room has free WiFi, a flat screen TV and very comfortable beds. This is the ideal spot for that getaway you’ve been talking about for days, weeks, months or has it been years. If you haven’t had an Inn experience for awhile, or ever, I do suggest you give it a try. It’s a lot more personal than staying at a hotel, which, by the way, I also happen to enjoy. Rates vary with room and season, but I think $109 to $119 is close to average. For reservations, 240-362-7111 orwww.cumberlandinnandspa.com. In short, I took interstate 695 and then to 70 to get to Cumberland in about two and a half hours. Shorter for me than Ocean City. Anytime is a grand time for travel to Western Maryland, but come autumn, the scenery will be spectacular. Book everything early.